Campaigners are calling on the local council to help save a Dorset hotel which featured in the film The French Lieutenant's Woman. 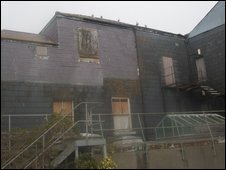 The Three Cups Hotel in the centre of Lyme Regis is owned by Palmers Brewery and has been derelict for 20 years. A public meeting has demanded the grade II listed building is made the subject of a compulsory purchase order. The brewery has said the economic climate was preventing it from reopening the building in Broad Street. John Grantham, of Community Alert on Pubs and Hotels, said 235 people turned up to Friday's meeting - four times the number who usually attend public meetings in the town. 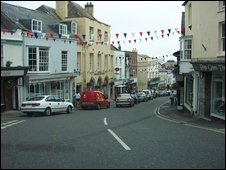 He told the BBC: "The story of the Three Cups is very much the story of Lyme Regis over the last 150 years," he said. "It's the iconic place that parts of The French Lieutenant's Woman was shot in. Jeremy Irons, who is supporting our campaign, featured in the film. "But it's also where Tolkien stayed as a child and developed his early ideas on The Lord of the Rings and The Hobbit." A long list of famous people have also stayed at the hotel, including Tennyson, Charlie Chaplin, Chesterton and Dwight Eisenhower. "It's a marvellous place full of heritage," he added. "The idea is that it is compulsorily purchased and sold on to someone who wants to buy it as a grade II listed hotel and not, as the owners have suggested, to make flats and commercial units out of it." A brewery has said plans to redevelop the pub over the past 14 years had been prevented by unstable land in the area. West Dorset District Council has since carried out remedial work as part of the Lyme Regis coastal protection scheme, but the brewery said it was now the economic climate that was preventing it from reopening the building. The campaigners will hold another meeting next weekend to decide how to progress their plans.